Bicycle! Bicycle! : Guess how close this is parked to artisanal bread. Guess how close this is parked to artisanal bread. A rare pleasure: An Australian Papillionaire bicycle on the streets of Perth, many miles away from the Melbourne hipster cluster that birthed it. I spotted this one parked outside a firmly suburban, middle class 'Farmer's Market'. (Nowhere near any farmers.) Yes, I was there buying artisanal gluten free bread and brownies. I am nothing if not a raging hypocrite. I'd previously seen a lone black Papillionaire in a shop display (it was not available for test rides) but had long admired their website pictures and wanted to see others in person. Especially that blue. I appreciate the solid looking back rack being coated the same colour as the frame. I wonder if the lack of a sprung 'trap' on the rack was responsible for the owner leaving croissant carrying duties to the silver bike's panniers? 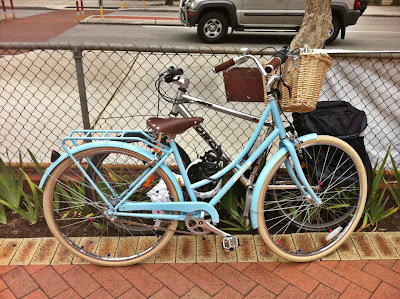 Of course, there are systems for carrying without a trap - Maybe she wanted something to match the charming front basket? The accessories offered by Papillionaire are certainly in keeping with the vintage aesthetic - leather grips and saddles embossed with the butterfly. Stylish (in YOUR opinion) and functional is key to loving your bicycle enough to use it regularly and Papillionaire bicycles certainly seem like they tick both boxes. If they ride as prettily as they display then there's a lot of hope for the Australian bicycle industry.